This is this week’s sketch from Mojo Monday. 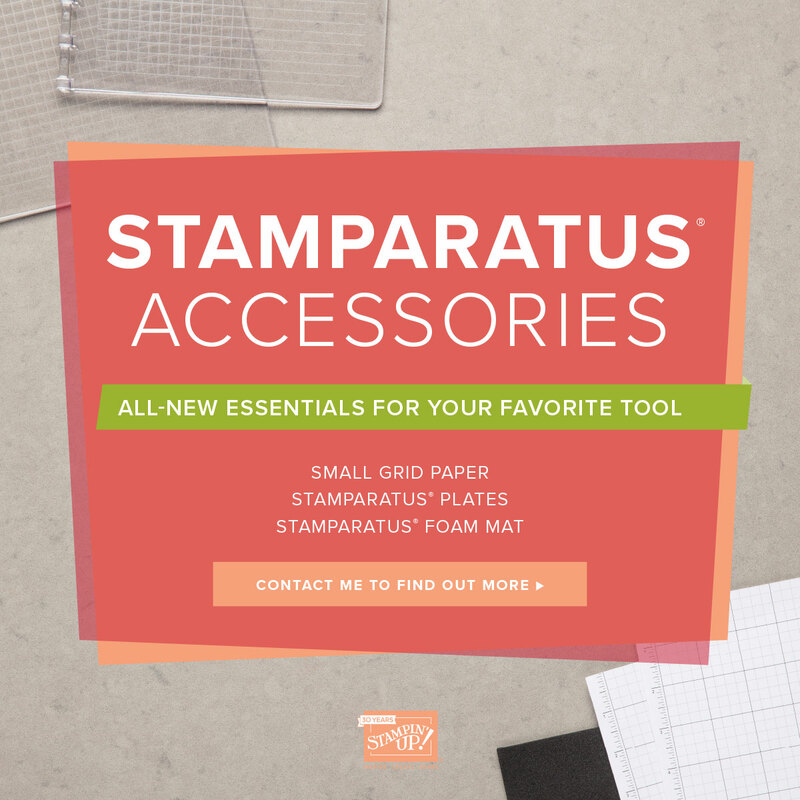 Although the actual card base was Whisper White Cardstock, after I chose the DSP from the Typeset Pack, I bordered it with Very Vanilla Cardstock. 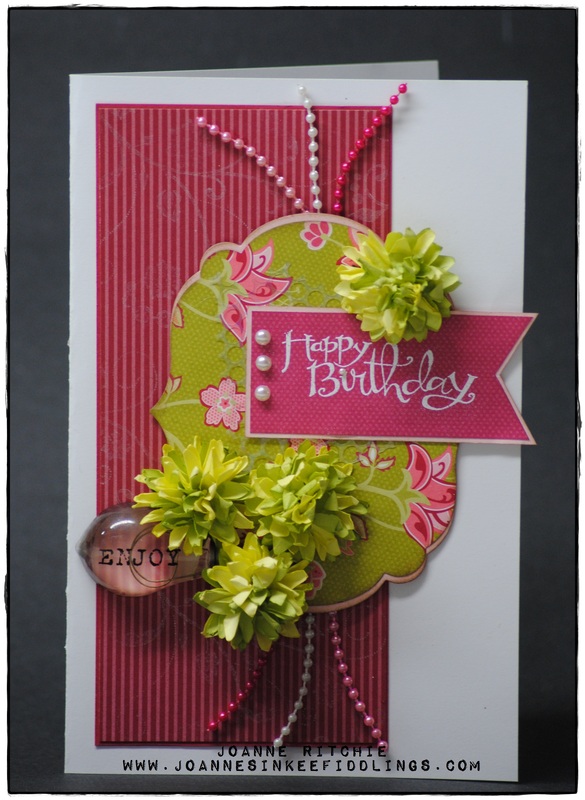 Both the DSP and cardstock were sponged with Crumb Cake Classic Ink. 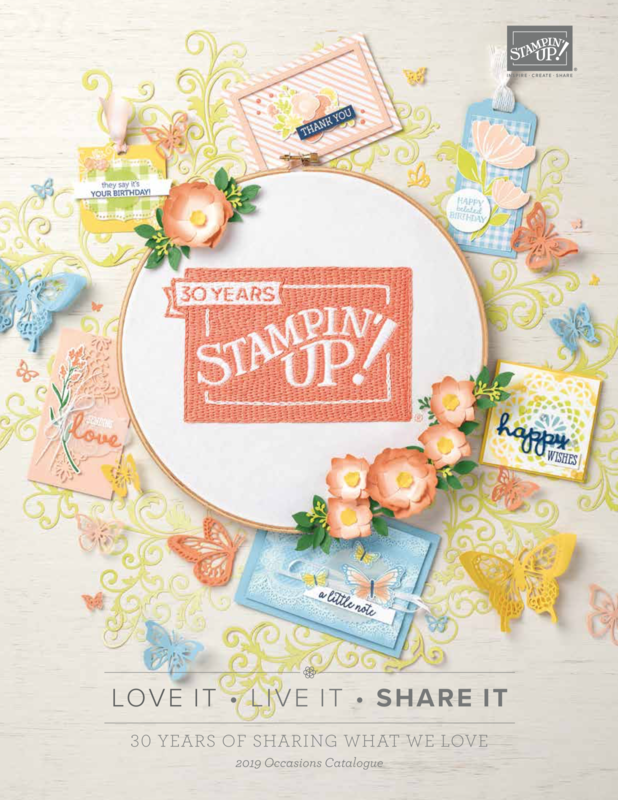 For the ruching across the card I used some of the beautiful new Very Vanilla 5/8″ Satin Ribbon – I am SO glad this is part of Stampin’ Up’s! 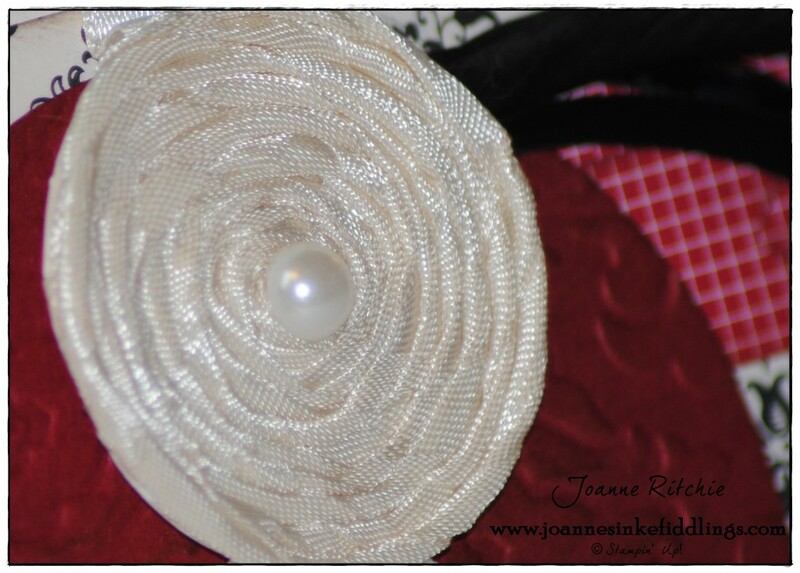 ribbon selection now as it’s so wonderful to work with. In regards to the Ribbon Bundles, I promise I’ll get to it by week’s end and have prices posted for you – many thanks for your patience – it’s much appreciated. Anyways, one thing has led to another and here it is, NOT even first thing this morning rather late at night but regardless, here I am finally posting it. 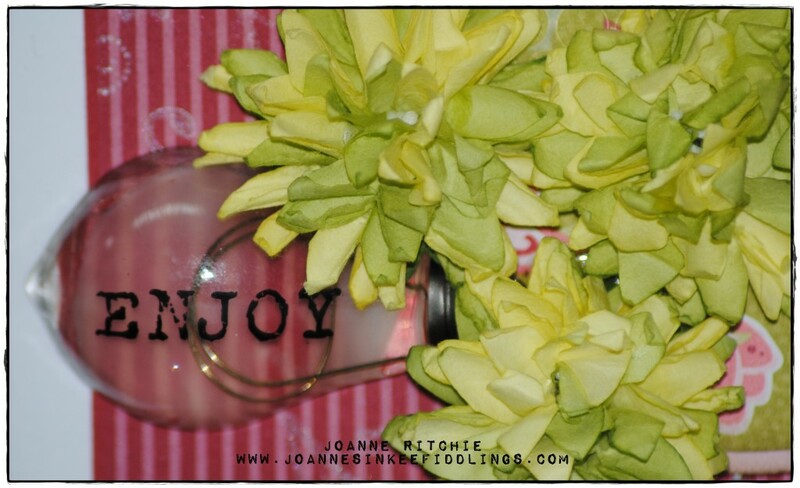 The basis of my card is this week’s Mojo Monday Sketch 323. 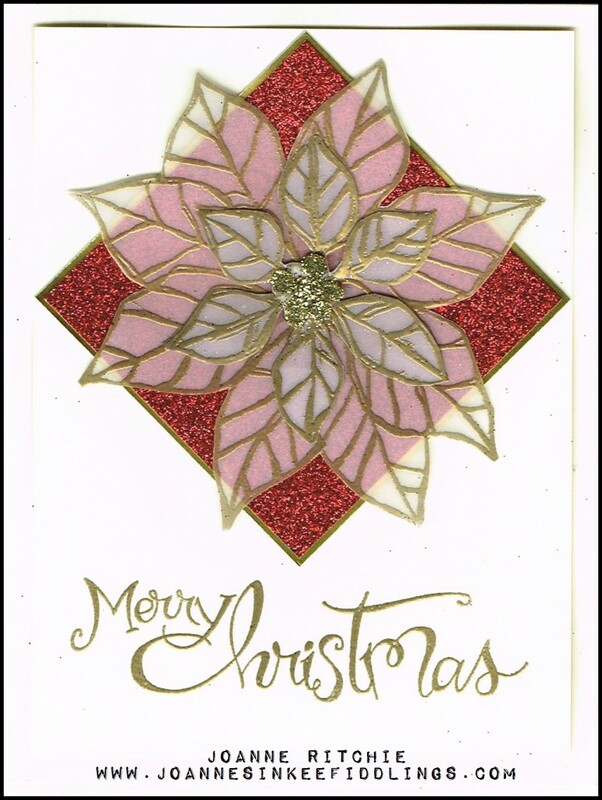 The striped paper I’ve used is from last year’s SU Regals Designer Series Paper Stack which I’ve stamped Flowering Flourishes in that wonderful Illuminate Ink, both from this year’s Annual Catalog. Then I’ve replaced the thread over the DSP shown on the Mojo Sketch with strings of pearls sprouting from either end of the labels which have had the edges sponged in Crumb Cake. Both of these labels have been cut from the same sized frame-lit, the difference being the Pink Pirouette cardstock was then cut in half so there would be a little showing on either end with the pointed middles snipped off. 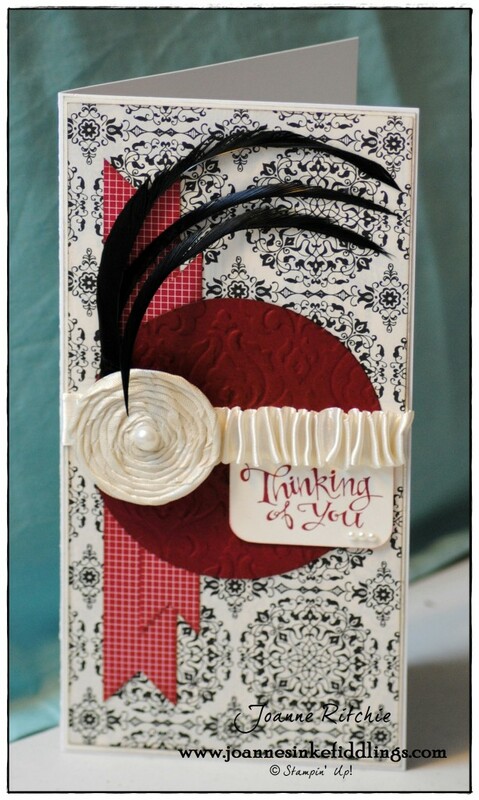 Of course it’s only now as I look at the card I realize the weight I’ve put in it isn’t the best for posting, lol! 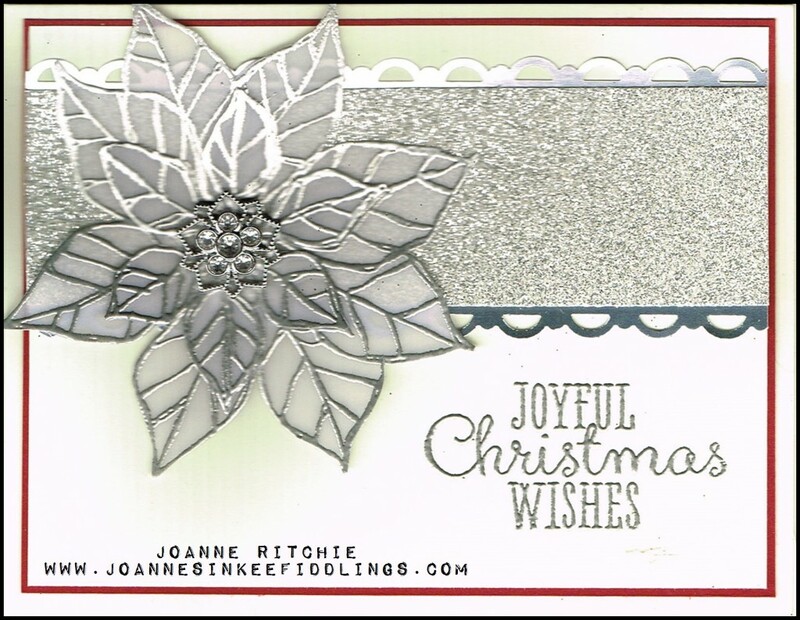 Preparing for a workshop last week which was focusing on heat embossing, I had the best time creating. I just couldn’t decide what design would be best so kept creating until it “felt” right. This was one of my first creations. I just love how the silver embossing is so striking on the white vellum cardstock which I’ve then mounted on the silver glimmer paper. Of course, just a smidge of Cherry Cobbler always adds to the Christmas feel with the sentiment from Sassy Salutations finishing it off nicely! 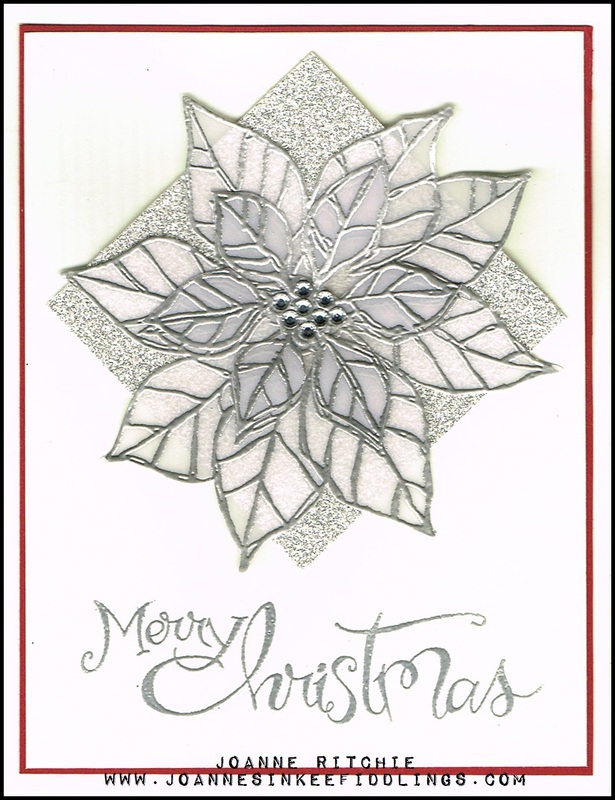 Having made the card in silver and white, I couldn’t resist trying it in a combination of Very Vanilla and Gold Embossing. The red this time was the red glimmer paper behind the flowers that had been fussy cut and mounted upon it. Aren’t my gold “balls” just the best, lol? I was determined to have gold balls in the center of my flower so I bunched up a mini glue-dot and doused it with gold glitter! There’s only one date still available for a workshop in December but I am taking bookings for the new year. Keep in mind if you are thinking of having a workshop, Sale-a-bration begins 28 January. It remains the same as last year that with every $60 spent, you get a selected item FREE. 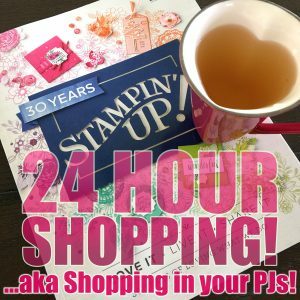 PLUS, when your workshop sales reach $200, you receive an additional $40 to the already $35 of any product you would like FREE. Have a think and let me know as dates ted to go quickly during this event! 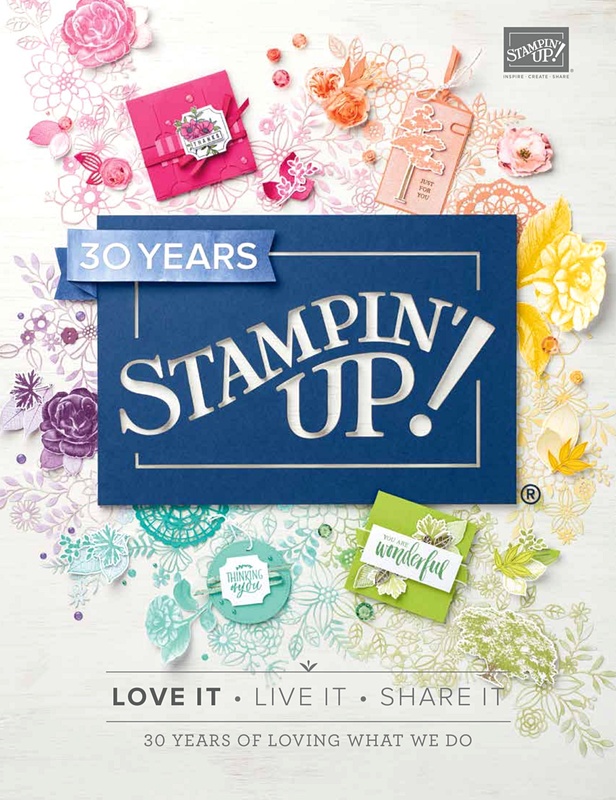 Until the end of this month (June 30), Stampin’ Up! 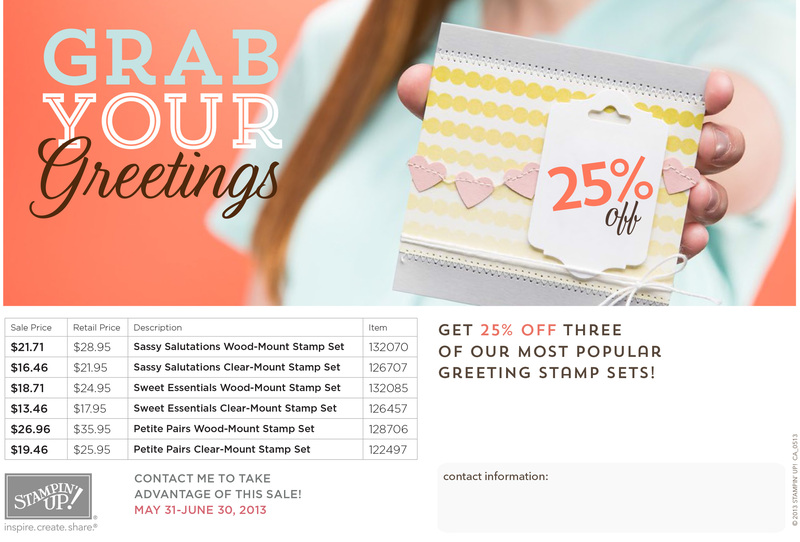 are offering 25% OFF three fabulous sentiment sets. Yes, 25% OFF! As all THREE of these sets were on my carry-over wish-list from the last annual catalog, I feel the time has come to admit defeat and purchase them. What can I say, at 25% OFF, yes please! 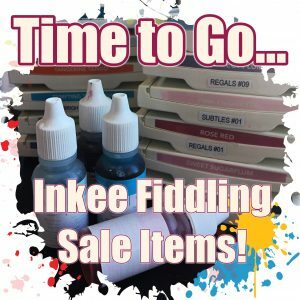 Therefore Inkee Fiddlers, I shall be submitting an order by week’s end so should your life also not be complete without one or ALL these stamp sets, please do not hesitate to contact me with your needs (inkeefiddlings@gmail.com).